People in Scotland, and all around the world, will be cutting into a haggis today or lifting a wee dram to the memory of Robert Burns. St Andrews does not have a huge amount of holdings in relation to Burns, but we have selected something from the beginning of his life, something from his publishing career, and a rare item from the last month before Burns died. 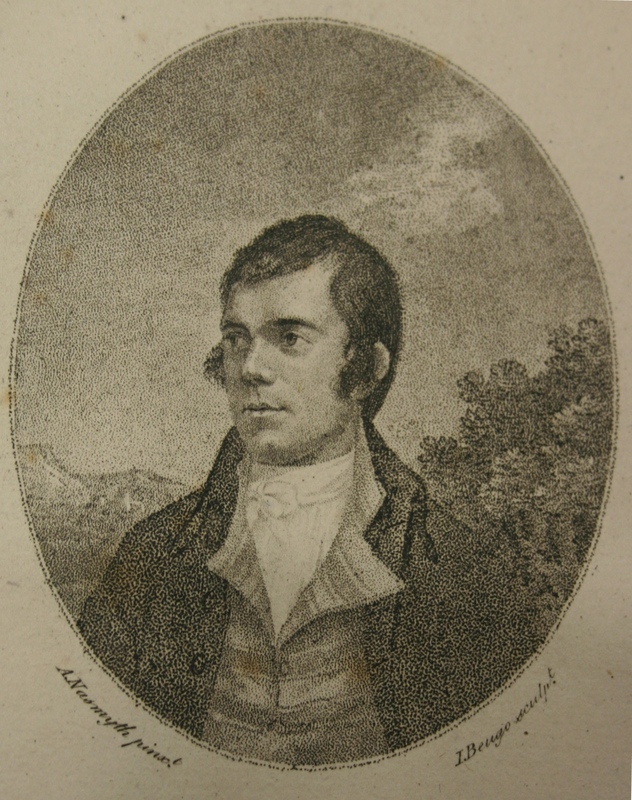 If you are interested in the life of Burns, or you’d just like to know more about why this day has been set aside for this poet, you might like some of these items found in our collections. Enjoy! Old photograph of Robert Burns boyhood home set in the village of Alloway in which the poet was born during a snowstorm on 25 January, 1759 (Valentine collection in a scrapbook album (VGA 101). Now a forming part of a complex heritage site that includes a new museum and the Auld Kirk of ‘Tam o’ Shanter’ fame, the old cottage, or as Burns referred to it “the auld cley biggin”, built by his father, William, was home to the poet up to the age of seven. It later became a public house, as can be noted here by the signs either side the main door, the one to the left is obscured but appears to commemorate the poet, whilst the one on the right reads “M Alexander. Licensed [to sell] Wines, spirits and ales”. It had various tenants after the Burns family moved and became an ale house in the latter half of the 18th c. Known by the 19th c. as ‘The Burns Heid’, the cottage was by then something of a pilgrimage site and watering hole. It was registered as ‘Ayr. 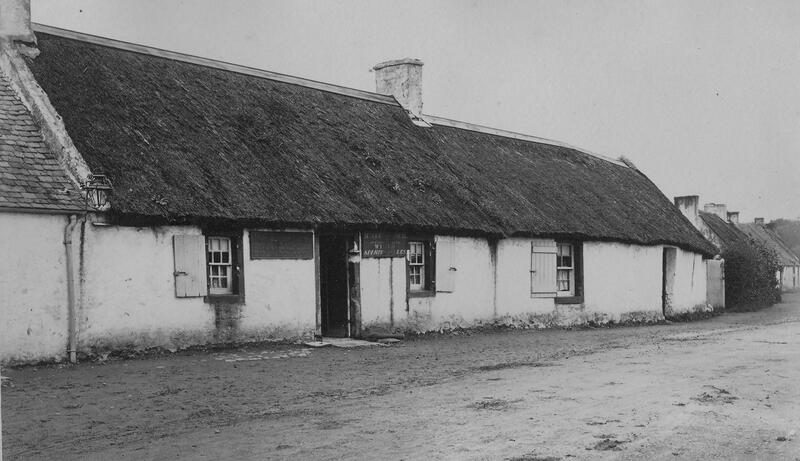 Burns Cottage’ in 1878. This cottage was integrated as part of the Robert Burns Birthplace Museum, opened in 2011. The photograph is held in the Valentine collection in a scrapbook album (VGA 101) into which various Scottish topographical photographs plus a few scenes of London (by Scottish photographer Francis Godolphin Osbourne Stuart) have been tipped-in (pasted). It was registered in 1878 but may well predate that year, as 1878 was the first year the Valentine’s began registering their expanding stocks of photographic plates. 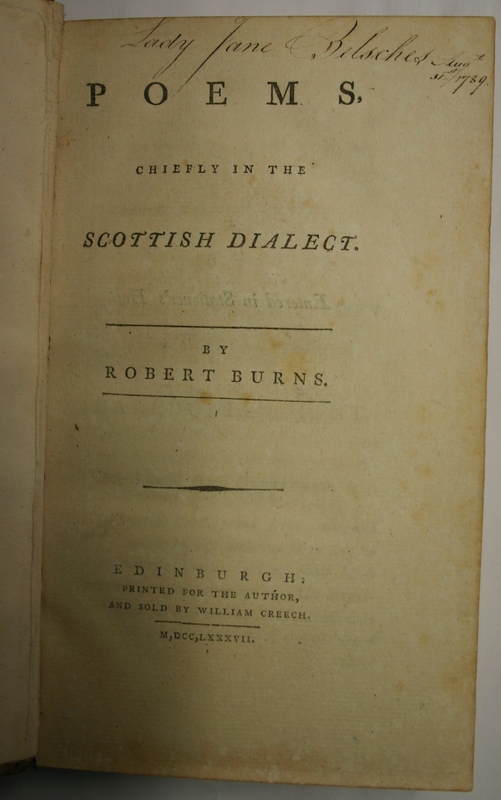 The title page of the 1787 ‘stinking’ edition of “Poems, chiefly in the Scottish dialect,” with the inscription of Lady Jane Belches at the head. 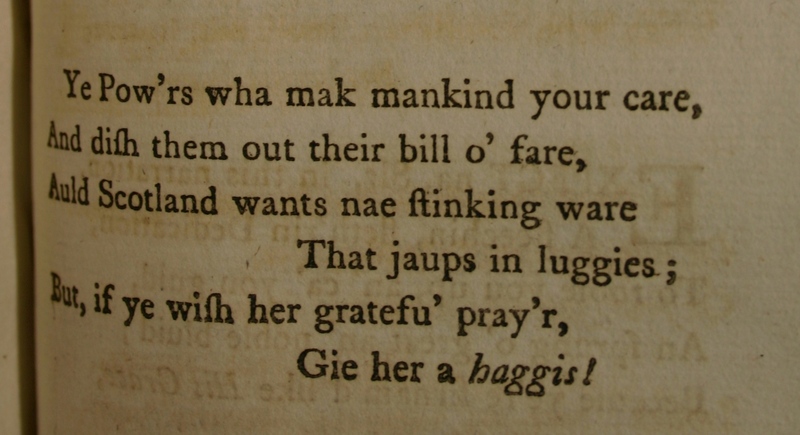 The misprinted stanza in ‘Address to a haggis,’ from the 1787 Edinburgh edition of “Poems, chiefly in the Scottish dialect”. St Andrews has three copies of this edition, the item pictured above is from the library of James David Forbes (1809-1868). It has a contemporary inscription at the head of the title page: “Lady Jane Belsches Augt. 31st 1789”, i.e. Lady Jane Belches of Fettercairn in Kincardineshire, mother of Williamina Belches (who would become Walter Scott’s love interest). The journal entry, over three pages, of James Macdonald for 2 June 1796, in which a dinner with Burns is recorded from the evening previous. I arrived here from Dumfries this evening, after a ride of about 30 miles in the most romantic country the mind can conceive. Yesterday Burns the Ayrshire Poet dined with me; and few evenings of my life passed away more to my satisfaction. Fall’n indeed unto the Earth.